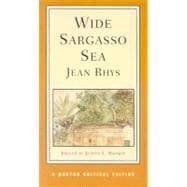 Written over the course of twenty-one years and published in 1966, Wide Sargasso Sea, based on Charlotte Bronte's Jane Eyre, takes place in Jamaica and Dominica in 1839-45. Textual notes illuminate the novel's historical background, regional references, and the non-translated Creole and French phrases necessary to fully understand this powerful story. Backgrounds includes a wealth of material on the novel's long evolution, it connections to Jane Eyre, and Rhys's biographical impressions of growing up in Dominica. Criticism introduces readers to the critical debates inspired by the novel with a Derek Walcott poem and eleven essays.